hatching a patch: Teency Weency Turlets! We woke up extra early today to take Raquel to her first day of pre-school. I was more nervous than her for sure. She was just plain excited, kinda like a bull in the pen right before they open the gate and he busts out and starts bucking like crazy.I had spoken to the teacher yesterday about what to expect today. She said that a lot of kids cry when their parents drop them off the first time. I told her I was pretty sure Raquel would run away from us when we got there because she is so excited to go to school. Turns out I was spot on. Right when we got there, Raquel flocked to the other kids and the assistant teacher and immediately began participating in classroom activites while Jose and I sat down with the teacher to talk about everything. I watched her from where I was sitting (in one of those tiny chairs) and marveled at how she looked like she'd been there forever. The teacher invited me to inspect the in-class bathroom. Everything was tiny! I got a real kick out of that.My sis in law works in the office at the school. She escorted us to the classroom and said she, too, was nervous and excited! She stayed with us and took several pictures which I am SO thankful for as I wasn't sure I was allowed to photograph anything. She got some great shots.When Jose and I were done with the teacher, we tried to say goodbye to Raquel but she only barely turned her head to say, "Bye!" really fast, couldn't care less that we were even there! I'm SO glad she wasn't like me when my mom dropped me off the first day of school. I was hysterical to say the least. 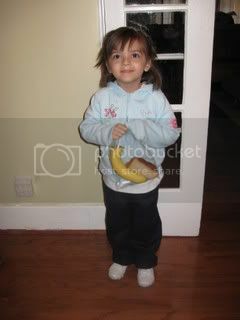 Here she is about to leave for school, carrying her breakfast to eat in the car. It's an 18-minute drive to school. From tomorrow-on her grandma and aunt Rosy will be driving her to school (since Rosy works at the same school) and I will pick her up. 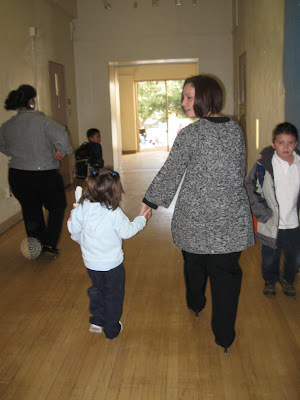 Here is Aunt Rosy escorting Raquel to her class. 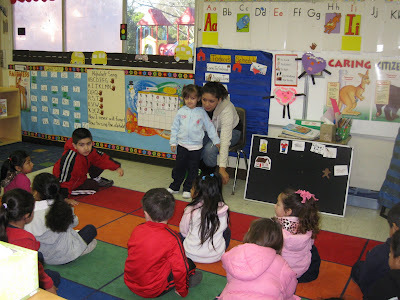 Assistant teacher introducing Raquel to her classmates. Jose and I talking with the teacher. Sitting in the front row. When I picked her up after school, Raquel didn't have much to say except that she did not get to play on the computer in class and she didn't remember her teacher's name or what she learned today. She was pretty quiet on the drive home. I guess she had a big day and needs time to think about it. That is so cool. I'm glad she took to it well. I think you guys have been great about introducing her to people and training her to be a people person. That's probably why it went so well with her. Hope it goes as well with Maxine. Oh and it was green. That's appropriate. I'm hereby officially a sapple today. Well, elm, I am glad you finally joined in the game! I, too, had a TERRIBLE first day of school. I couldn't stop crying and I felt betrayed by my mother who said she wasn't putting me in school that day, just "showing me around". Next thing I know, she's handing me off to the principal and they closed the school gate. She lied and left me! Raquel is a lot like her mother but she's definitely not shy like I was. yeah thats great that raquel was outgoing and secure with being left there. I cried for a few weeks i believe...she said i had to have the principal walk me to class everyday for some reason that helped lol. i hope lucas is like raquel or i might cry too. Sam, I remember a picture of you in kinderfarten<--total accident! But too funny to erase! Ok, so you were in kinderGarten wearing a little black and white polkadot outfit, swollen-eyed from crying and still red-faced. It is so heart-breaking! You were traumatized, no doubt. Do you remmeber that time?